Sometime last year, my Uncle told me he had a book I would love. My Uncle understands me pretty well, so this piqued my interest. 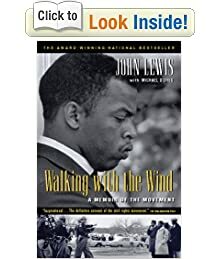 I asked him what it was about, and he said it was written by a guy named John Lewis, and it was about the Civil Rights movement. I told him I would check it out sometime...then he said that my cousin, his son, said he felt like he wanted to be a better person after reading this book. My cousin is a pretty good guy, so I figured this must be some kinda book. The first 2/3s should be required reading in every American history class. It is a first-hand account of the Civil Rights movement, focusing especially on how much of the success was a result of grass-roots efforts. It also went into the politics behind the movement -- which, yes, there were lots of politics at play. I feel like we didn't learn much about the movement in my classes. Maybe a little about Rosa Parks and Martin Luther King, Jr. This book opened my eyes in a way no other book ever has. And it gave me a new way to look at people with whom I disagree, whose ignorance astounds me. We are entering a huge time in our history, where we have the opportunity to make progress or move backwards. There is an eerie similarity to the Civil Rights movement and what's going on now. When zealots on either side of the coin obscure the issues, and use false reasoning to progress their cause. As we move to a place where more and more rights could be taken away, it is important we look back at this very recent history (John Lewis, the co-author and one of the leaders of the Civil Rights movement, is still serving in the Senate). All of this just happened about 40 some odd years ago. Now's our chance to move forward. I just hope the best choices are made, and that in 40 some odd years, we look back at the "big" issues now with disbelief.